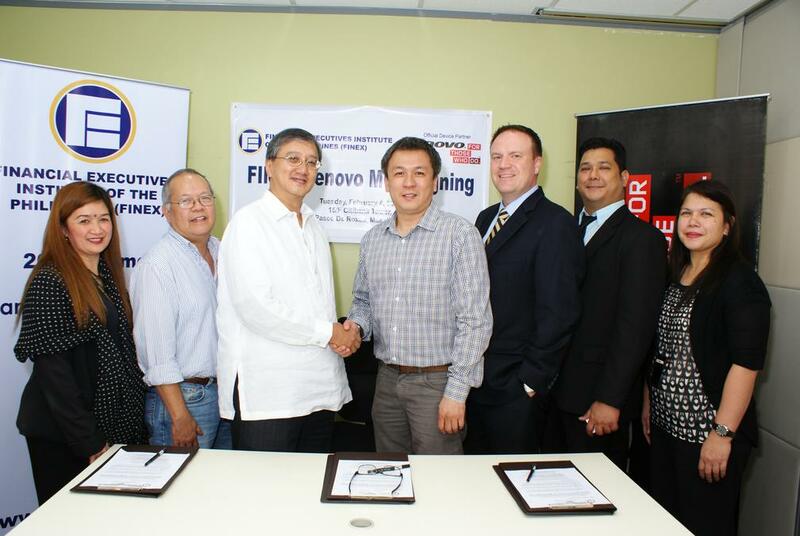 Lenovo has signed a partnership agreement with Financial Executives Institute of the Philippines (FINEX) to become FINEX’s official device sponsor. This sponsorship will help educate FINEX members about modern applications that can enhance their financial knowledge and skills while improving business productivity through the use of Lenovo’s innovative PC Plus devices and solutions. FINEX is a non-stock, non-profit, non-political association of finance professionals and practitioners in the country that is dedicated to the advancement of financial knowledge and expertise to better serve business, government, society and the academic community. Some of the country’s most respected CEOs and CFOs are active members. “By helping the country’s top finance decision-makers leverage advanced technology, we are not only teaching them the necessary tools and skills they need to take their operations to the next level; we are also telling them about a resilient, reliable and secure computing platffom to help them cope with market demand and make a difference on a macro level,” said Michael Ngan, Country General Manager of Lenovo Philippines. Lenovo’s presence at FINEX events such as its various general membership meetings, conferences, seminars and receptions will also allow finance industry leaders access to product demonstrations, videos, promotions and presentations of Lenovo, to help enhance their knowledge on ICT in general. Photo above shows Edmundo Soriano (3rd from from left), President of FINEX, and Michael Ngan (4th from left), Country General Manager of Lenovo Philippines, sealing their partnership agreement with a handshake. Joining them in photo were (from left:) Nanette Malvar, Country Manager, Relationship Segment, Lenovo Philippines; Vic Dela Dingco, VP for Internal Affairs of FINEX; Brian Russel Hachez, Chairman of FINEX ICT Committee; Antonilo D. Mauricio, Liaison Director of FINEX ICT Committee; and Anna Abola, Marketing Communications Manager of Lenovo Philippines. “Given that ICT has become indispensable in the modern age, CFOs will now have to develop their own ICT competence to drive company sustainability. By banking on Lenovo as our device sponsor, today’s financial executives will have the right tools and information they need to enhance productivity in their organizations and save on lifetime costs of their PC fleets. Through our partnership with Lenovo and also by learning about the company’s Think range devices, we are confident that we will be able to sustain the momentum and growth of financial institutions locally,” said Edmund Soriano, President of FINEX. As it advances in the PC Plus era, Lenovo will continue to improve its visibility and accessibility to better serve the financial sector’s increasing IT requirements, especially in a period marked by anticipated economic growth.